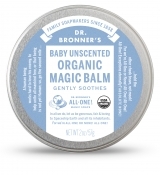 The Baby Unscented Magic Balm runs $7.99 and provides instant relief and protection from cold-wind-clothing that has rubbed you raw. Soothe skin safely and simply, no synthetic ingredients, certified to the same National Organic Program that certifies food. Made from a soothing blend of organic beeswax, organic coconut, organic avocado oil, organic jojoba oil and organic hemp oil. Use to moisturize and heal chapped/dry skin anywhere on your body! Quickly treat dry hands or cuticles, chapped chins or cheeks, provide relief for chafed skin where needed. Heal recently tattooed skin and brighten up old tattoos! For tattoo care, wash your tattoo with one of their soaps, pat the area dry and apply a thin layer of Organic Body Balm over the tattoo. It is also good to use for babies, such as on diaper rash or on their sensitive skin that might be dry or chafed. 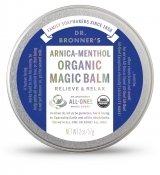 The Arnica Menthol Organic Magic Balm is $9.99 and is for different uses. It helps to cool and soothe sore muscles and achy joints with a potent blend of arnica, camphor, menthol and peppermint oil. The base of organic beeswax and organic oils: avocado, coconut, olive, jojoba and hemp oils nourish and moisturize skin with no synthetic ingredients. None! Massage gently into sore muscles, arms, legs, chest and back. Always towards the heart! Health is wealth! Avoid rubbing the balm too close to your eyes, as the vapors from the balm can cause you to tear up. Keep out of cuts or burns, do not rub the balm internally, it is meant for external use only. I like to use this on my sore knees that have arthritis and when I have muscle aches. 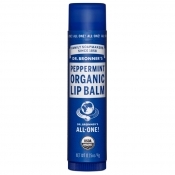 Dr. Bronner's Organic Lip Balms, made with organic beeswax, provide a protective barrier to the elements with no synthetic ingredients. None! They contain organic jojoba, avocado and hemp oils to help with extra moisturization. Only the finest essential oils are used for fragrance. 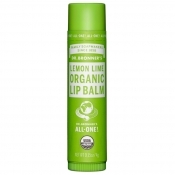 Certified organic to USDA National Organic Program standards, because what you put on your lips goes into your body. 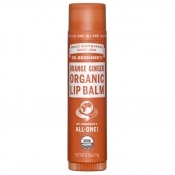 The Organic Lip Balms are great for protecting lips, apply them in cold, windy, or dry weather. Moisturize and heal chapped, dry skin anywhere on your body! Use them to quickly treat dry hands or cuticles, revive chapped chins & cheeks and provide relief for chaffed skin. The Naked Organic Lip Balm is $2.54, while the others are $2.99. I would not use the scented ones, such as the peppermint near the eyes. Otherwise, all of them work great. I don't have a favorite scent, I like all of them equally. But if I had to pick one I really wanted it would be the Orange Ginger. I love Ginger. And I love Orange. The lip balms are very healing to the lips, making them feel so much better when they are chapped. Dr. Bronner makes a number of different products, such as oral care, soap and body products. They are committed to making environmentally and socially responsible products. Dr. Bronner's uses fair trade ingredients in their products that help the communities where the ingredients came from. So their ingredients are not only fair trade but are organic too. You can find Dr. Bronner products at www.drbronner.com. You can also find them at health stores. There is a store locator on the website. Like Dr. Bronner on Facebook:https://www.facebook.com/DrBronner; Follow Dr. Bronner on Twitter:@DrBronner; Follow Dr. Bronner on Pinterest:https://www.pinterest.com/drbronner/; Follow Dr. Bronner on Instagram:https://www.instagram.com/drbronner/ and Subscribe to Dr. Bronner on YouTube:https://www.youtube.com/user/DrBronnersMagicSoaps.